How does driving on the right side of the road affect drivers field of vision? Keeping to the right improves the field of vision of the drivers in the vehicles behind you. Driving on the right reduces the view angle of those driving behind you. There is no connection between driving on the right and the field of view. The field of vision is not affected: A comfortable field of view can only be created by doubling the required distance between vehicles. What might be the cause of loss of control of a vehicle? Driving too fast and not wearing seatbelts. Driving too fast, lack of vigilance and being unfamiliar with the vehicle. Driving too fast and having non-functional head rests. Driving at a reasonable speed and being unfamiliar with the vehicle’s mechanisms only. What are the specific risks and problems in crossing intersections? 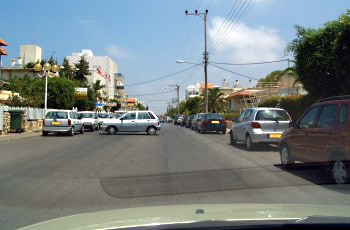 Many and various contact points between the different types of vehicle through the intersection. Crossing the intersections takes a long time; an upsetting fact for drivers. The fact that vehicles approach the intersection from different directions causes no problem. The problem is only with pedestrians. 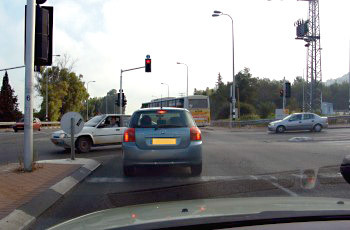 Specific risks and problems are present only in intersections with traffic lights. What should you do when you are about to start driving after stopping or parking at the side of the roadway? You should signal with your left hand and swiftly merge with traffic. .
You should, before starting to drive, signal and then get on the road quickly. Make a left-signal and drive. The other vehicle should give you right-of-way. You should signal appropriately and ensure that you can merge with the traffic without endangering other road users. What conduct can be expected from the vehicles in the following picture? 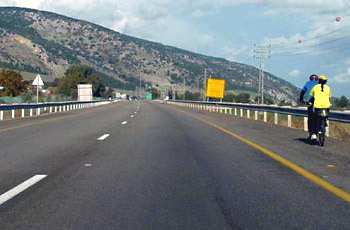 To slow down at the entry to the sharp curve and keep driving on the far right of the roadway. Only the dark vehicle is obliged to slow down before entering the curve. 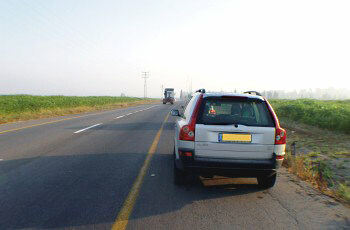 The white vehicle shall stop on the right side of the road and give right of way to the dark vehicle. The dark vehicle shall stop on the right side of the road and allow the white vehicle to proceed. The driver’s reaction time and the vehicle’s speed. The proper function of the vehicles brakes. Unintentional, resulting in injury, including the driver, or property damage, or both. An incident that characterizes young drivers only. An incident that can always be prevented. A premeditated incident resulting in property and infrastructure damage only. What limitations does a driver experience while driving in reverse? Limited field of vision and uncomfortable vehicle operation. An experienced driver has no limitations while driving in reverse. It is hard to control the braking system while driving fast and needing to operate many systems. Driving in reverse takes more time. What risks are expected whilst driving on a mountain road? Engine heating due to excessive use of the brakes. Loss of braking ability and head-on collision. Difficulty yo pull off the road. Loosening of a wheel due to the roads steep slope. In your opinion, why was a continuous line marked on the roadway? Because of the limited field of vision ahead. Because of the tree lines on both sides of the roadway. Because there is a bus-stop bay on the right side of the roadway. Because the roadway is narrow. What are the most important conditions in order to safely pull onto the “hard shoulder”? 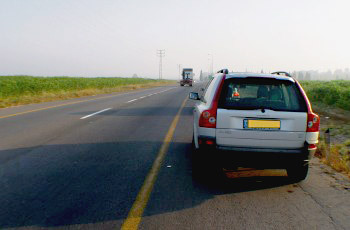 The only important condition is that it is permitted to stop on the “hard shoulder”. That the hard shoulder and the road are in the same height and that the hard shoulder is wide enough. That the hard shoulder is paved with asphalt or concrete. That there are no color markings on the hard shoulder. Before starting to drive, what action needs to be taken by the driver before moving the automatic transmission selector? Release the clutch pedal, to connect between the engine and the gear box. Step on the accelerator, to start driving immediately. Release the parking brake, to release the gearbox lock. Apply the foot-brake, to prevent the vehicle from moving. 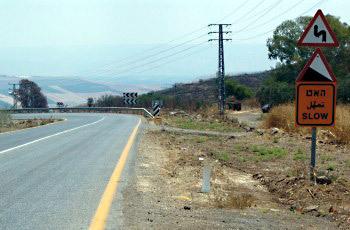 How should you behave when approaching the road section described in the following picture? Keep to the right of the road and enter the curve with cautions. 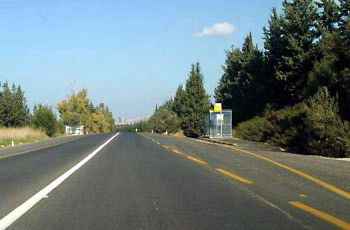 Keep to the right without changing your driving speed. Slow down considerably and keep driving on the left side of the roadway. How can we overcome the problem of tiredness whilst driving? By driving faster to shorten your journey and arrive home early. Black coffee is the solution for all problems. A short break and a heavy meal will drive the tiredness away for a long time. By having adequate rest before driving and making rest and refreshment breaks during your journey. Keep your foot on the brake pedal so that you can also stop if needed. Try to overtake it so it will be behind you. 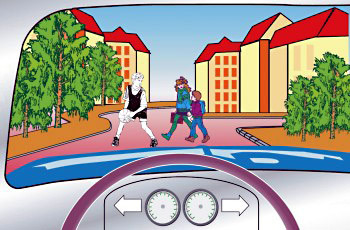 Always keep sufficient distance from the vehicle in front . Stop immediately upon noticing the brake lights of the vehicle in front, regardless of your distance from him. What are the risks in making a U-turn? 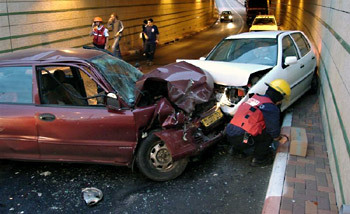 Colliding with vehicles coming from the opposite direction or from behind. Causing an approaching vehicle to make a sudden brake. What are the elements that contribute to vehicle skidding? The old age of the vehicle. Every element that prevents direct contact between the tire and the roadway, such as: water, oil, mud, gravel, etc. Any element which affects the drivers alertness. 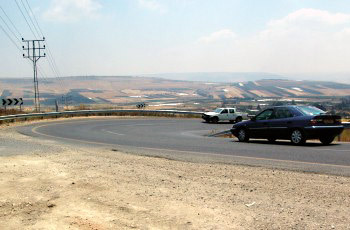 What risks should be taken into account on the following roadway? 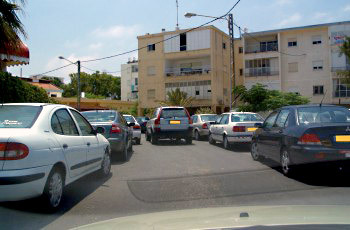 Vehicles are parked adjacently to each other and pedestrians cannot cross between them. There is no risk in the following roadway. Sudden appearance of pedestrians or children from between the parked cars. What are the provisions for driving in a straight line, without swerving? Which of the following accessories reduces passenger impact severity during an accident? Seat belts, airbags and head rests. Head rests and the brake and clutch pedals. Rear windshield wipers and head rests. How can we moderate a situation in which our vehicle skids on the road? Through correct speed ,steering and a correct and early use of the brakes. By strongly turning the wheel left and right, to stabilize the vehicle. By holding the steering wheel firmly with both hands. By stepping firmly and continuously on the brake pedal. What are the characteristics of a mountain road? Mountain roads are never paved. 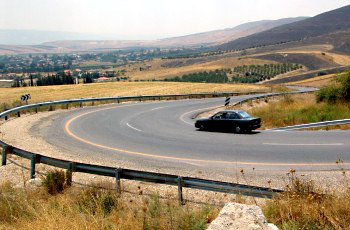 Narrow and winding roadway, sharp curves, bends and sudden slopes.